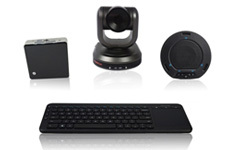 The Phoenix Audio Smart Spider is a high quality USB speakerphone with PoE capabilities. Easily connect the Smart Spider via USB or analog connection to your phone via 2.5mm input. A 2.5mm to 3.5mm cable is included with purchase. The perfect accessory for huddlerooms, conference rooms, and boardrooms. The ability to daisy chain up to 14 units makes this speakerphone very adaptable for small to large rooms. 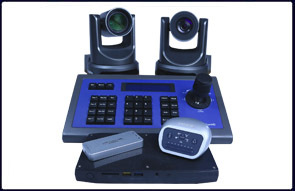 Four microphone beamforming array, Full duplex communication, Echo cancelling, Noise suppression, De‐reverb, Automatic gain control, Daisy chainable, Single source daisy chain powering, Bridging between USB and “Smart” device, Internal battery, Interchangeable interface modules, Durable aluminum casing, LED lit control buttons, Intuitive and interactive user interface that is incorporated through LED lights discreetly placed throughout the unit. The Spider comes to life when it is in action and displays only the needed functions depending on the specific scenario to provide an easy to use audio solution for your conference room. Power consumption: 5V 500mA peak through USB and wall mount AC/DC converted. We have this daisy chained from a Phoenix Audio Spider USB and SIP/IP Phone which is great since it only takes one cat5e cable to connect it. The sound is perfectly synced and both mics will pickup your voice!